"We are proud to recognize Gayle for her heartfelt work in connecting people, especially youth, with horses," said Kate Russo, equine biologicals marketing manager, Zoetis. 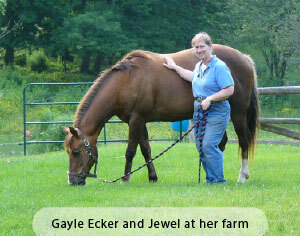 "Gayle&apos;s passion for utilizing science-based knowledge to educate people on the health of horses is unmatched. Zoetis is proud to present her with an award to recognize her lifelong commitment to advancing the equine industry." She also led the development of Equine Guelph&apos;s youth exhibit, EquiMania!, which features interactive stations that teach young horse enthusiasts about equine safety and wellness. The exhibit first appeared at the 2005 Can-Am All Breeds Equine Expo and also has traveled to the 2010 World Equestrian Games™ in Lexington, Kentucky, and the Minnesota State Fair. Each year, Ecker and her team improve the exhibit with up to 25% new materials based on attendee feedback. "I am so grateful for the opportunity to be recognized," Ecker said. "My passion is truly my students – seeing their thirst for knowledge and knowing the time I invest will be tenfold when they go out and make a difference." As a former researcher, Ecker&apos;s expertise is in exercise physiology. She has been the assistant chef d&apos;equipe for the Canadian Endurance Team, traveling around the globe to support the team at international events, such as the Pan American Games, the World Equestrian Games and World Endurance Championships. These days, Ecker enjoys trail riding aboard her two quarter horses. Ecker also was named to the Can-Am All Breeds Equine Expo Hall of Fame in 2014, when she received the Builder Award. In 2010, she received the Readers&apos; Choice Award in the exceptional equestrian category from the Equine Consumers&apos; Guide 2010. Ecker also was named one of the top 15 horse people of the year by Western Horse Review in 2008. • Juli S. Thorson, editor-at-large for Horse & Rider.